Solar Cigarette has outdone themselves with their 2nd generation smokeless cigarettes. Now smokers can get a dose of vitamins that will help keep off the weight and also help them fight nicotine when using their vitamin refill packs. Many smokers have had terrible struggles with trying to keep tobacco cigarettes out of their lives because of the nicotine cravings are too overwhelming and the fear of weight gain after they quit smoking makes it an almost impossible goal. Now Solar Cigarette gives smokers the same sensation of smoking a real cigarette but without the need to burn tobacco in order to get the nicotine hit. Smokers who use the Solar Cigarette electronic cigarette inhale water vapor that either has a small dose of nicotine or a dose of multivitamins that will help smokers live a much better lifestyle. 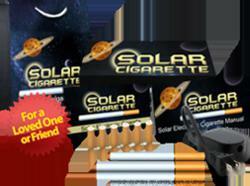 The Solar Cigarette is the only electronic cigarette of it's kind that offers these great benefits to smokers. "The ever so life changing Solar Cigarette vitamin B pack. It’s a one of it’s kind cartridge pack, which allows you to receive your daily vitamins and nicotine with every puff. While many people think that vitamins are similar in structure and perform a similar function, the truth is that each vitamin B-complex vitamin has a unique chemical structure and serves a unique function within the body." A representative of SolarCigarette.com states that smokers who have used the Solar Cigarette are now enjoying zero nicotine vitamin packs which only gives them a small dose of ginseng, or vitamin B instead of nicotine. Our clients started using medium strength nicotine cartridges but now get the same feeling of smoking real cigarettes but without the nicotine. They feel more energy and have a more positive attitude because they gave up the habit and moved on. Learn more about Solar Cigarette Vitamin Packs.